All those long, cold, rainy days and nights of winter, all those muddy, drizzly drawn out weeks of spring. THIS is what I was waiting for. Today it has been muggy and very hot; I’ve been sweating since I stepped out of the shower. My clothes are damp and dank and musky. My hair feels like it has been coated in olive oil. Today I walked the dogs in the heat, chatting with a neighbor about the breathless feel of the air and the difficulty in getting anything done. I did some chores, pulled some weeds, picked some of Paul’s fresh strawberries, all while feeling the drips of sweat coming from my hairline down to the tip of my nose. I have kept the dogs in the house, under the whirring ceiling fan. We’ve all been drinking cold water and lying around as still as we can lie. I love this weather. Today was tropical. 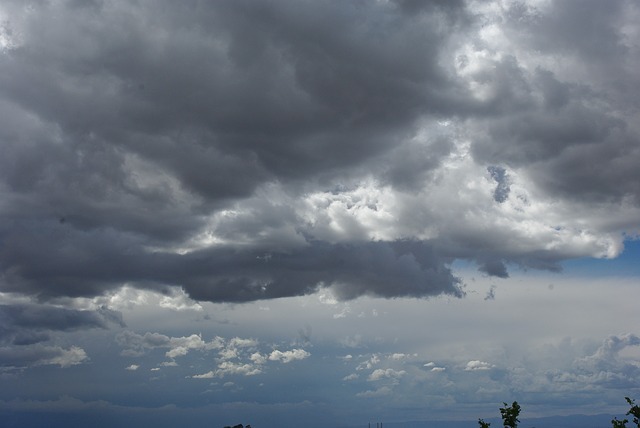 This afternoon, after my lunch of fruit and cold, cold yogurt (OK, frozen yogurt, but still…..) the sky began to change. The soft white clouds that have been drifting from south to north for the past three days began to stack up and turn gray. The sky went from the palest silky blue to gunmetal gray. The wind picked up and showed me the undersides of the maple and oak leaves. All afternoon, I have been waiting. My poor old Sadie, my fearless lab who will face any pitbull or any scary human, has been shaking and panting for hours. Her only fear is loud noise, and she has stayed glued to my right leg all afternoon. “You’re OK”, I have been telling her. “It’s alright.” We have been sitting side by side, watching the sky, for almost three hours now. Finally, in the past thirty minutes, the storm has broken. The wind is arching the trees almost to the ground. The rain is pounding down and rushing down the drive in small shiny rivers. The flashes of lightning are made even brighter by the fact that the day has turned so incredibly dark. The house is hushed and close; all of the windows are closed, because the wind is swirling from every side. Sadie is crouched beside me; her eyes are so frantic. I wish I could tell her that we’re safe! The lightning is striking close; much closer than usual. The last big crash happened just as the flash hit, and the whole house thrummed with the energy. I am hot, and breathless and I feel the hair on my arms prickling. I can hear the storm passing over us, moving off to the North at last. I love this weather! This afternoon was exactly what I yearned for during all those cold and snowy drives home this winter. I love it too! What a great little storm, we haven’t seen that much rain for a while! 🙂 Pat Sadie for me! Poor little drooling wreck of a girl….I’ll tell her that you said to “man up”! How is Boone handling it all? My service dog has a storm issue as well. He climbs into bed with me at the first, far distant crack of thunder. If I’m not there, he’ll come get me, plainly saying, “Hey, you’re supposed to be in the bed so you can protect me!” I guess like magic covers, that’s the only place the magic works. Have you tired one of the Thunder Shirt thingies? We tried his Service Dog vest (which looks the same), but it didn’t do anything for Dawg. I haven’t tried the vest; keep hoping that my kind, calm affect will convince her to relax. She does a lot better as the summer goes on, so I do think that it has some effect on her poor psyche! Duncan, my new puppy, is currently experiencing his first thunderstorm, which is off in the distance. So you can enjoy this one for the two of us, Moms! Its so funny; my other dog, Tucker, has never batted an eye at thunder. He absolutely couldn’t care less. On the other hand, he’s suddenly afraid to walk the length of my hallway! You are describing my evening. The storm tore through here like a raging bull. It was rather amazing. Because of it we will probably have a very balmy July 4th. Happy Independence Day, by the way. Thank you! And to you! May your grill be hot and your history lessons be truthful…..OK, that was weird. May you thoroughly enjoy your celebrations tomorrow!!! Its crazy how much I enjoy those huge storms; I am so not a thrill seeker (scared of roller coasters, scared of sky diving, etc, etc) but I love the rush that I get from all that power up there. We are having our 4th of July with Arthur, rainy and cool here! Loved your last post!